Alita: Battle Angel, the live-action take on Yukito Kishiro’s cyberpunk manga, is set for a Valentine’s Day release. Fox is putting some serious effort into making this movie a hit. Produced by James Cameron and Jon Landau, directed by Robert Rodriguez, and featuring a ridiculously talented set of actors, it has the kind of foundation to nail the page-to-screen foundation. A critical part of being true to that vision is visual effects. We sat down with the film’s Visual Effects Supervisor, Weta Digital’s Eric Saindon, to talk about working in visual effects, bringing a classic manga to life, and what it’s like to live your dreams. three BAFTAs, and four Visual Effects Society Awards. 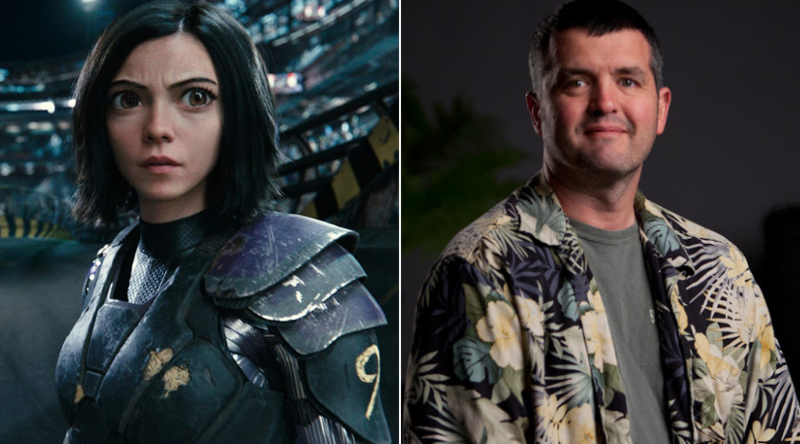 He serves as Visual Effect’s Supervisor for Alita: Battle Angel. The Geekiary: How did you get started with visual effects? I met Mark Sylvester, who started Alias|Wavefront, in a bar one night after an animation user’s group meeting where he’d given a speech, and he offered me a job. I ended in Santa Barbara doing animation. Then I got an offer to go to New Zealand for a director I’d barely heard of (Peter Jackson, director of The Lord of the Rings, which lists Eric Saindon as a characters/creatures supervisor). [laughs] So I went, and I’m still here. You’ve worked on some awesome films. Is there one that’s your favorite? I tend to think more in terms of directors. I’ve been lucky to have worked with some really talented ones. The director I really like working with is David Lowery. I did Pete’s Dragon with him and his team, and they’ve done a few other films. I’d like to work with them again. I worked with them on A Ghost Story. (Eric Saindon was the VFX supervisor for the 2017 film with Casey Affleck and Rooney Mara). It’s definitely a lower budget film, but from every film you work on you learn something different. It’s fun to do something different every now and then. There’s a lot of fantasy and sci-fi in your background. Did you specialize in this, or is that just where the cool animation jobs are? I gravitate towards fantasy and sci-fi because that’s what I enjoy. That’s what I enjoy watching, so that’s what I enjoy making. Weta is big enough and does enough movies to have a lot of options. I’m lucky that I can go in that direction and work with some pretty interesting directors. From the trailers we’ve seen, Alita: Battle Angel’s effects are really striking. Is there something in Alita that you are especially proud of? Really, Alita herself. Alita is the first realistic human Weta’s had to put on screen in a starring role. We had to do some unfortunate editing in The Fast and the Furious [after star Paul Walker’s untimely death] which turned out well. I don’t think most people could tell where we used it. But mostly we haven’t had to do a humanoid CG character. It’s been Gollum, or King Kong. With a human we need to make sure we don’t fall into the uncanny valley. When you’re watching the film, we want you to forget you’re watching a CG character and I think we’ve done that by the second scene. There’s a very intimate scene where Alita comes down from her bedroom and she meets Christoph Waltz (playing Alita’s mentor Doc Ido) and they have a very simple moment together. He gives her an orange. She bites the orange through the rind and her whole body cringes up because she’s bitten this sour orange peel. Rosa [Salazar, starring as Alita] really did that on set, and it translated between her motion and the animation. You forget she’s a CG character. I think the way she’s directed by Robert Rodriguez really helps sell it. There’s so much detail that we’re capturing now. We have motion capture on her face and cameras all around the set, so we’re able to catch so much detail that Rosa puts into the character. That’s what shocks me when I watch it. There’s so much of Rosa in Alita that it really brings Alita to life for me. What kind of equipment do you use to capture that level of detail? We do a lot HDRI (High Dynamic Range Editing) to capture all the lighting information on set. We grab a whole 360-degree dome of lighting information -where they’re placed, the intensity- so we can put that back on our characters. We also use a lidar scanner. You pop it in the middle of the shot, it does another 360 scan, and gives you 3D geometry for each set. Because we’re placing our 3D character in each shot, we need to know where the walls are, chairs, objects, everything. For a movie like this we’re actually having to go to each set and wire infrared cameras to capture all the actors’ performances so we can put the motion back on the characters. In this film we use a Simulcam, a technology originally invented for Avatar (which Eric Saindon also worked on). Jackie Earle Haley played Grewishka and Jackie is only 5’5″. We capture Jackie’s performance, then we feed it back to the camera operator so we’re putting the character “on set” in real time. The camera operator can use that as a reference to really frame up for a big character like Grewishka. When you have a 5-foot Alita battling a 10-foot character things get complicated. With a Simulcam we don’t have to try to make Grewishka fit later on. We know he fits because he did during filming. The original manga, Gunnm (Battle Angel Alita in the English translations) has a lot of fans. What kind of problems have you run into trying to translate it for Alita in a way that makes those fans happy? It is a really tricky thing to do to do comic book movies well. Especially manga. There haven’t really been any good manga remakes yet. It’s a huge challenge for this one, to be the first one that pulls it off. Jim [producer James Cameron] came in and said “Forget the haters, go bigger.” We made her irises bigger, and that balanced it out. Audiences really liked that. Really, the bottom line is- if it doesn’t work next to the other characters, it doesn’t work. Here, with Alita, I think it works. Is there any project that you really want to do? Something that if it was announced you’s be banging on their door to work on? For me, it’s this. Battle Angel. Guillermo Del Toro had pushed it to Jim as a “Hey, you should do this” and I got really excited. I bought all the Kishiro books and read the manga and then Jim moved on to Avatar. I thought “Oh man, I’ll never get to do it.” Then after Pete’s Dragon (where Eric Saindon was also VFX supervisor) I got called in and asked if I still wanted to work on Alita. [laughs] I guess I need a new dream now. I need a new movie to want to work on. Many thanks to Eric Saindon for taking the time to talk with us. If you want to see his work on the film, catch Alita: Battle Angel in theaters everywhere February 14th! Next: Streaming Service Showdown: What Subscriptions Do You Actually Need?